Using authentic materials is certainly key to creating stunning architectural spaces. The Cementi Click collection was inspired by the beauty of minerals and the timeless elegance of cement, dear to Modernist architects. Concrete has personality and so does Cementi Click: the collection’s designs draw inspiration from geometric shapes and graphic patterns for a very contemporary look. 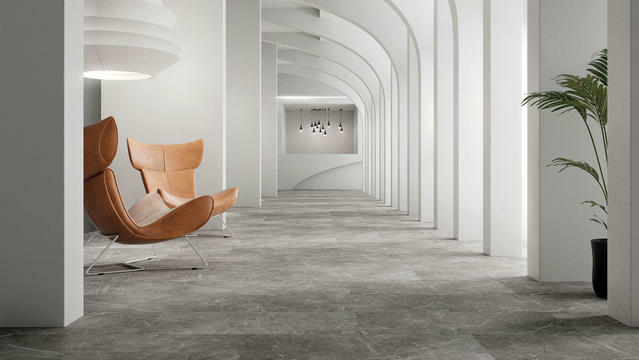 Produced from 95% clay, cement’s main composite, Cementi Click boasts the pure look and feel of this raw modern material. With overlapping hues and rugged patterns, the collection offers natural stone and concrete effects. Subtle marble or stone, ethereal decors, and natural clay tone effects create a pure and refined architectural atmosphere for designers and architects looking to create inspirational spaces from mineral textures. Cementi Click is a new generation flooring solution that is ideal for quick renovation projects thanks to its click system and little need for subfloor preparation. It can cover any surface including uneven ones and ceramic thus accelerating project installation and reducing business downtime dramatically. Also, the extremely rigid and stable core structure does not require expansion gaps for large surface installation which makes the installation process even easier. Cementi Click is also a highly functional flooring solution thanks to its acoustic properties with 19dB impact sound reduction and high traffic Class 33 resistance. Its foam backing layer helps diminish sound transmission to neighboring areas or floors. This is why Cementi Click is especially suited for spaces where noise levels can be high and customer comfort and well-being is key, such as restaurants, hotels and retail spaces in general.